What can I sow or plant in my garden now? Everything! Well, pretty much everything. You will be too late to sow most warm climate crops which need a long growing season like tomatoes, peppers and aubergines but nearly all the outdoor stuff is good to start now. May is really the best time sow or plant as the soil has warmed sufficiently and while frost is still a risk it is much less likely to be a problem. I am located in the North West so I tend to leave things a little late (I am also completely disorganised), but even for warm Southerly gardens May will be the busiest month in the garden. I have early peas in already from an April sowing but I also put in a second sowing in mid May which I will be doing this weekend. It is important to get your peas in now as the plants will most likely get powdery mildew later in the Summer and you want get your pea harvest picked before the disease hits. Early peas are a also a good idea if pea moth is a problem in your area; sow as early as you can (mid March is good) and you should have most of your harvest in before the pea moth lays her eggs. As you may know I prefer to start most plants off in modular trays in the polytunnel and plant out later. Usually the seedlings are planted out about 4 weeks after sowing before the roots get restricted by the plant tray but cabbage seedlings can be kept longer without affecting the crop. The ability to stand in the plant trays brings a handy advantage as you can drip feed the plants into the garden by planting a few every week over a month; the advantage is your cabbages won’t all mature the same time and you will get a longer harvest period. I have found this works for most members of the cabbage family with cabbage being the most resilient, cauliflower doesn’t like this treatment but brocollii, calabrese, kale and sprouts will allow an extra couple of weeks in the seedling tray before planting out. As you know we supply a broad range of vegetable seedling plants but apart from small globe varieties we don’t supply carrots as, like parsnips, they will not do well when sown in trays. Root crops really need to be sown in situ in a light soil with any large stones removed; obstructions will cause the root to fork as it negotiates a way around which results in odd shaped carrots. The same symptom is caused by digging manure into the beds as roots will divert to seek out the nutrients. As we have said, prepare your soil. If you have a heavy clay you will struggle with carrots unless improve the structure by adding large amounts of organic matter. This is what I did by adding manure, compost and seaweed over a number of years but its not a quick fix. If you want to grow carrots now on a heavy soil you should go for short root varieties like ‘Chantanay red cored’. Don’t be tempted, by the way, to improve a clay soil by adding sand (unless you add enough to make a 50/50 mix) as you will actually make the problem worse. Remove as many stones possible and rake the soil into a fine consistency or ’tilth’. Any soil amendments like well rotted manure should be added several months before sowing. Carrots are not heavy feeders so if your soil is reasonably good you should still get a good crop without feeding. 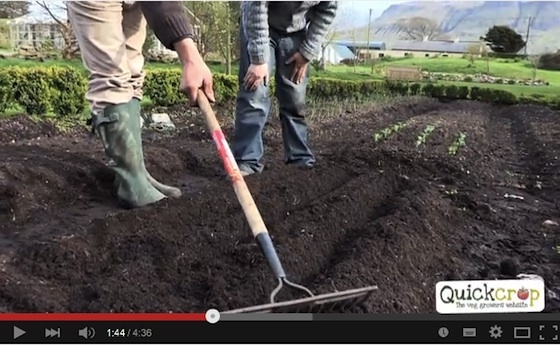 You should also try to get the soil as weed free as possible by hoeing regularly in the weeks before you sow. Sow carrots in 2cm deep drills (little trenches) spaced 25cm apart, you can be fooled into thinking the drill is deeper than it is by the soil piled either side so check relative to the surrounding soil level. The spacing for maincrop carrots is 3-4cm between roots but due to the small size of seeds you will find it almost impossible to achieve this; try to sow as thinly as you can to keep thinning (removing surplus seedlings) to a minimum later on. Damaged carrot foliage releases a scent which attracts the carrot root fly, this is why the less thinning you can do the better. Carrot root fly is a pest because its lifecycle includes grubs that tunnel into your carrots spoiling their appearance and making them prone to rot in storage. The organic method of avoiding this pest is to cover the crop for its lifetime under a layer of insect mesh; this is what I do and find it very successful. I have tried various methods of mesh support but my favourite is our ‘Mainframe’ system which I have used for the last 2 years. I made a video on constructing the Mainframe last year which you might find helpful (click on the video above), I made one large frame in the video but have since changed to two 6ft x 4ft frames as the 12ft one was a little unwieldy to move around. I am lucky to have as much room as I need in my vegetable garden as I live in the middle of nowhere (as my children keep reminding me) but if you have limited space and are growing in one or two raised beds then more compact crops may be of interest to you. Of course there are plenty of vegetable plants that are naturally suited to small spaces like salads, carrots or beet but the larger varieties can cause a problem. 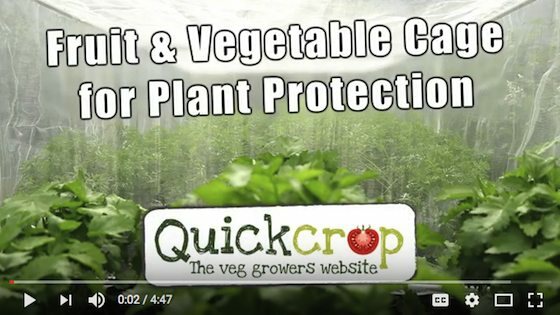 If you bear in mind that a full size cauliflower needs 60cm between plants you can see that it will quickly take over a small growing space and leave little room for anything else. You can produce smaller crops by simply planting closer together but this will work best if you choose the right variety. This year I have included a number of compact crops in our seedling range to help those of you who are a little tight on space. The plants available include broccoli ‘Kabuki’, cauliflower ‘Igloo’, pea, ‘Tom Thumb’, kale ‘Dwarf Green’ and dwarf French beans. Tony has written some brief descriptions of the these mini varieties on our blog which you can read by clicking the blue button below.